Browse: Home / Featured / A Doctor, A Lawyer, and An Indian Chief. A Doctor, A Lawyer, and An Indian Chief. Bill Wilson was introduced to Dr. Robert Smith who was not able to get and stay sober for any length of time despite his best efforts. Robert Smith told Bill that he would (reluctantly) give him 15 minutes. Robert told him that he had taken the cure, been to therapy had been prayed over, that he had been sliced and diced more than a Christmas turkey. What possibly could he tell him in fifteen minutes that would keep him sober? Bill Wilson’s reply I am not here to keep you sober, I am here to keep me sober, they ended up speaking for six hours: that was the first meeting of Doctor Bob and Bill Wilson. Dr. Bob was indeed intrigued but was not yet convinced that a life run on self will could hardly be called a success and the illusion of control is the last to let go. Bill stayed in touch and could sense a breakthrough with a kindred soul who also had the same liken affinity for the spirits. After several weeks of sobriety, Dr Bob felt he could safely go to the American Medical Association convention in Atlantic City. He was drunk before the train left the Akron station, and a mighty bender ensued. Then I went to Atlantic City to attend several days’ meeting of a National Society of which I was a member. I drank all the Scotch they had on the train and bought several quarts on my way to the hotel. This was on Sunday. I got tight that night, stayed sober Monday till after the dinner and then proceeded to get tight again. I drank all I dared in the bar, and then went to my room to finish the job. Tuesday I started in the morning, getting well organized by noon. I did not want to disgrace myself, so I then checked out. I bought some more liquor on the way to the depot. I had to wait some time for the train. I remember nothing from then on until I woke up at a friend’s house, in a town near home. These good people notified my wife, who sent my newly-made friend over to get me. He came and got me home and to bed, gave me a few drinks that night, and one bottle of beer the next morning. My last drunk was similar in regards to how much liqueur he drank. My drink of choice was cheap rum and lasted about 6 days. It creates a pretty good bottom. I believe to all historical accounts that was what happen I speak to the motivation we also commonly refer to as the turning point or the jumping off place and for Dr. Bob it speaks to humiliation, Bill having to buy him a beer so as a doctor he could perform his surgery certainly would be a very humiliating turn of events providing a sufficient amount of pain that an action was birthed from that moment of clarity. As that humiliation gave Dr. Bob the humility he was lacking to go forward with his amends. It happened sometime between leaving the house for his surgery and before returning. Probably it came during the surgery as a guess. Bill must have still been at the house when Dr. Bob returned to hear him utter the fateful words “I am going through with it” It could have been Ann, but I am quite sure she was more than tired of hearing all his resolutions. “I am going through with this” spent the balance of his first day of sobriety making amends (still smelling of alcohol) to people he had harmed. He never had another drink. That was Dr. Bob’s last drink. I believe the humiliation of having Bill see to his needs so that he could operate as a doctor in his surgery was the last nail in his drinking career. Eighteen days later (as some historians say) he had reaffirmed all Six Steps of the Oxford Group and agreed in principle to the “The Four Absolutes – Honesty Unselfishness Love Purity, And told Bill that the only way they were going to keep this thing (sobriety) was they had to give it away. 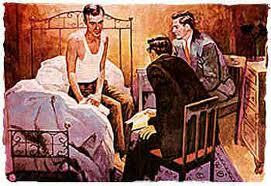 The two men of destiny went to Akron’s City Hospital June 26, 1935. And there met Bill Dotson, the “Man on the Bed,” was AA number 3. … His date of sobriety was the date he entered Akron’s City Hospital for his last detox, June 26, 1935. When two or three are gathered with no other affiliation they can call themselves an A.A. group. When two or three are gathered in my name I shall be amoungst them. The painting done in 1955 is an iconic description of A.A. in the throws of gestation. “The Man on the bed”. The fellow in the foreground has a book in his hand, 4 yrs before the publication of the Big Book of Alcoholics Anonymous. The only book that was allowed in the hospital usually was a bible. The cast of characters were most interesting, Dr. Bob, Bill D. (lawyer) and the chief architect of A. A. Bill W… So to start this thing of ours we had a doctor, a lawyer, and an Indian chief. Bill D. was number three in recovery, proving that the power of one drunk talking to another still to this very day remains our most powerful tool of persuasion.